Why Visit The Gold Coast? The Sunshine Coast north of Brisbane is not only full of beautiful beaches but also hinterland hideaways and gorgeous national parks. I spent a few nights here on a road trip up the east coast. I stayed at a campsite overlooking Noosa River and loved having barbeques watching the sunset over the water. Noosa consists of Noosa Heads, Noosaville, which is by the river and Noosa Junction. I would really recommend exploring Noosa National Park, right on the coastline, the scenery is superb from crystal clear waters to leafy rainforest. Look out for koalas and dolphins too. There are some nice shady spots complete with benches along the national park walks that are great for a picnic. But beware of bush turkeys, they love sandwiches! 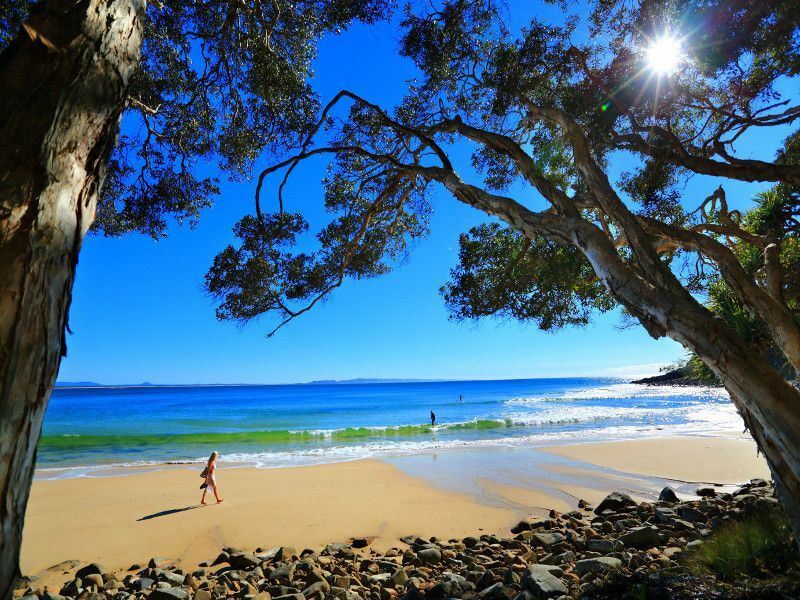 Noosa’s beaches are excellent for watersports such as surfing and kitesurfing. For an adventure hire a kayak and head up the river to Noosa’s Everglades. For something a bit different, take a horse or camel ride along the beach or through the bush. A chic town centre full of boutique shops along with stylish restaurants and bars are perfect for an afternoon drink or evening meal. South of Noosa lies Peregian, Coolum, Maroochydore and Caloundra, all have magnificent beaches perfect for catching those Sunshine Coast rays. To get up close to some of Australia’s marine life Underwater World in Mooloolaba is the place to go to dive with sharks and swim with seals. The Sunshine hinterland is an interesting area to explore after touring the coastline and home to the magnificent Glass House Mountains. The shapely peeks dotted amongst the otherwise flat landscape make for an unusual sight. Follow the tourist drive signposted from the Bruce Highway to the Glass House Mountains look out point, it’s a nice area to take photos and there are some short walks too. For the more adventurous, climb these dramatic peeks Tibrogargan is 253 metres in height with an impressive viewpoint at the top. It has some pretty steep, rocky tracks to get there though. Visit the quaint hinterland village of Maleny to pick up some organic treats, browse art galleries and enjoy the slower pace of this popular area, full of bohemian characters and arty types. The Maleny Music Weekend due to be held this year on the last weekend in August showcases the best artists in the area with live performances, food and craft stalls along with some interesting workshops such as circus skills and banjo lessons. This is definitely a local event worth experiencing. Head to the quirky town of Eumundi, 18 miles from Noosa in the hinterland, find an interesting souvenir at the markets here held every Wednesday from 8am-1.30pm and Saturday 7am-2pm. Plan to arrive at the markets as early as possible to get parked if travelling by car and to avoid the crowds. From jewellery, to art, furniture, clothes, local produce and handmade goodies the ethos of the market is: ‘We make it, bake it, grow it, sew it.’ Running since 1979 the market now has over 600 stalls along with performances from local entertainers and some fantastic food stalls. Look out for the Potato Slinkys stall, selling spiral shaped potatoes on sticks, delicious! After shopping try a locally produced ginger beer at Joe’s Water Hole or Imperial Hotel. Finally a trip to the Sunshine Coast would not be complete without stopping at the world famous Australia Zoo. Run by the well-known Irwin family, this is the place to see native Australian wildlife from crocs to kangaroos and everything in between along with exciting live shows it makes for a memorable day out. I love the diversity of the Sunshine Coast from beaches to the hinterland it’s a lovely place to visit on a day trip or for a longer stay, there is just so much to explore. Article written by Nicola Dunkinson.